“Had San Bernardino shooter Syed Rizwan Farook used an Android phone, investigators would have had a better chance at accessing the data”, says Jack Nicas in his article in The Wall Street Journal. Indeed, the stats suggest that only 10 per cent of the world’s 1.4 billion Android phones are encrypted, compared with 95 per cent of Apple’s iPhones. Of those encrypted, a major number are using Nexus smartphones that have encryption enforced by default. What is the reason behind this low encryption adoption rate among Android users? Let’s first have a look at how encryption is enforced by two major mobile OS manufacturers, then look at how it’s implemented by either company. Android 5.0: Encryption Is Enforced… or Not? With the release of Android 5 ‘Lollipop’, Google had plans to enforce full-disk encryption on all devices released with this version of Android. (Devices upgrading from older versions of Android would be exempt). Motorola-built Nexus 6 was the first smartphone released with Android 5 that not only had encryption enabled but offered no possibility for end users to disable it (not unless they used a third-party kernel). Compared to similarly specced Moto X 2014 manufactured by the same company, the new Nexus had a dramatic drop of sequential read speeds. Being 8 times slower compared to its non-encrypted sibling can surely be attributed to encryption. Performed on the same device, this test clearly demonstrates how severe the penalty was on the Nexus 6 once encryption was activated. No doubt this has become a reason for Google to quietly back away from encrypting new Lollipop devices by default (ARS Technica). So what happened, exactly, to cause such a dramatic drop in performance? Let’s look at the Snapdragon 805 SoC that was used to build the Nexus 6. While Apple used a 64-bit ARMv8 design in iPhone 5S, Qualcomm was struggling to build a 64-bit CPU at the time. Back in 2014, Snapdragon 805 was the company’s top-tier CPU with four custom 32-bit Krait cores. As a result, Qualcomm had to offer encryption hardware acceleration for Snapdragon 805 in the form of crypto QCE. Apparently, something went wrong when merging crypto QCE drivers into Android 5.0 AOSP, and so Google chose to disable encryption hardware acceleration altogether at the time they launched Android 5.0 and the Nexus 6. 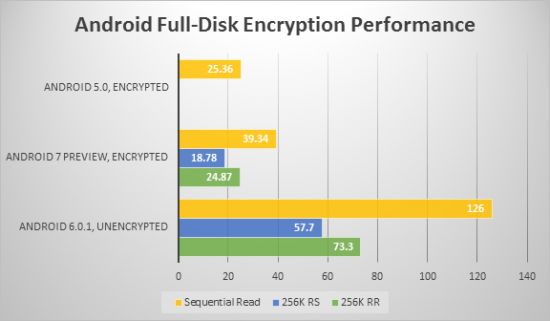 Android 5.1: Finally, Hardware-Accelerated Disk Encryption Is There! Or Not. Apparently, the situation around Android 5.0 was temporary. Google were up to something. Indeed, in Android 5.1, Google added support for hardware-accelerated disk encryption. Unfortunately, this feature ended up disabled in Android on Nexus 6 because of ongoing stability problems. So what exactly was going on? Android implements full-disk encryption, and allows encryption acceleration with a crypto API driver that must be compiled into the kernel. The driver takes advantage of the phone’s encryption acceleration hardware such as the cryptographic module built into Snapdragon 805. Once utilized, this allows encryption to be performed on a dedicated unit with low power consumption instead of the main CPU. This can both improve disk access times and reduce battery consumption (more on that later). Hardware-accelerated full-disk encryption is many times faster compared to software-based implementations, and takes significantly smaller toll on the phone’s battery. Unfortunately, hardware acceleration using the dedicated Qualcomm module had to be disabled in the release version of Android 5.1 due to some major stability problems on the Nexus 6. Apparently, Google failed to properly implement hardware-accelerated encryption support in Nexus 6. 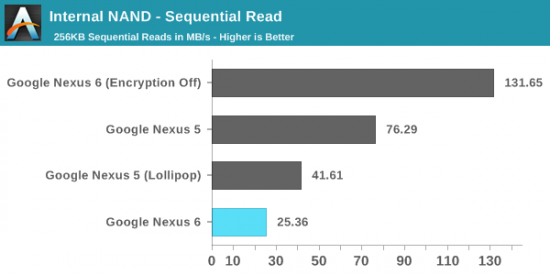 The Nexus 6 was about to showcase the benefits of full-disk encryption to OEMs building their handsets. No wonder the OEMs were not impressed, and Google had to lift the requirement for OEMs to release Android 5 devices with FDE enabled out of the box. Following the failure to properly implement full-disk encryption on 32-bit systems in Android 5 and 5.1, Google continues its journey. At this time, the company wants OEMs who make devices that run Android 6 out of the box to enable full-disk encryption by default. Did Google manage to work out the bugs with dedicated encryption hardware found in their 2014 flagship, the Nexus 6? Nope. Instead, they decided to use a workaround. The ARMv8 specifications offer a set of commands to implement AES acceleration on the CPU. These instructions are available in all 64-bit ARM CPU’s including the extremely popular mid-range Snapdragon 410 SoC. While not a proper replacement for a dedicated encryption module (according to Qualcomm itself), these instructions provide so-called “software acceleration”, which is, well, better than nothing. Software-“accelerated” encryption offers access speeds that are “only” two times slower compared to unencrypted performance. (For comparison, Apple’s iPhone 5S relying on Secure Enclave and a dedicated encryption chip has zero encryption performance penalty). In addition to that, dedicated encryption acceleration hardware is available in some systems (such as Snapdragon 810). If a dedicated encryption module is available, it (theoretically) has a higher priority compared to software-based implementations. Unfortunately, Google does not seem to have a grip on that. Both the Nexus 5x and Nexus 6P only come with “software acceleration” provided by the ARMv8 specification instead of utilizing the dedicated cryptography acceleration module built into Snapdragon 810 (source). As you can see, the Moto E (2015) using an ARMv8 CPU (Snapdragon 410 in fact) is “only” two times slower when reading encrypted data, while the ARMv7-based Moto G (2014) without built-in encryption acceleration is 4 times slower to read encrypted data compared to unencrypted performance. Why do we believe it’s a load of crap? Because using and researching both major systems, iOS and Android, allows making observations and drawing conclusions. Apple’s encryption implementation is exemplary. A dedicated, low-power chip handles encrypted I/O without waking up the main power-hungry CPU. On the contrary, “software-accelerated” encryption wakes up the main CPU cores every time the phone needs to read or write a bit of data onto the encrypted disk. These constant wakeups drain the phone’s battery extremely fast compared to using the same device without encryption. Activating encryption on an Android smartphone is just shooting oneself in the foot. Reduced performance and battery life will follow. This is the reason why Android users are not enthusiastic about full-disk encryption as opposed to 95 per cent iOS users who are happy with it. This, and not the fact that Apple mandates FDE on all devices since iPhone 3GS. Update 21-03-2016: Android 7 to the Rescue? (We no longer have a Nexus 6 running Android 5.0, hence no 256K RR or 256K RS readings for this OS). As can be seen, Google significantly improved FDE performance on Nexus 6 since introduction (from 25.36 MB/s in Android 5.0 to 39.34 MB/s in Android 7.0, both running full stock OS). 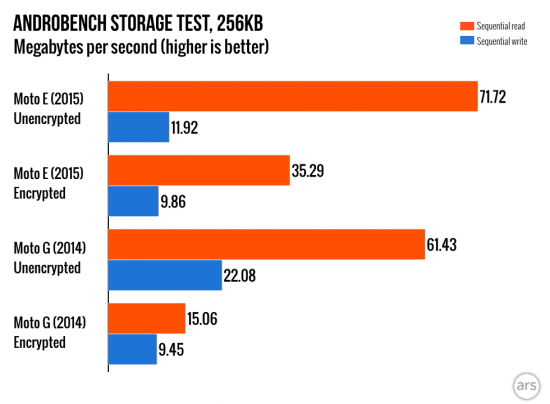 In the days of Android 5.0, encrypted sequential read performance was 8 times slower than unencrypted reads. Today, it’s ‘only’ 3 times slower compared to unencrypted reads. 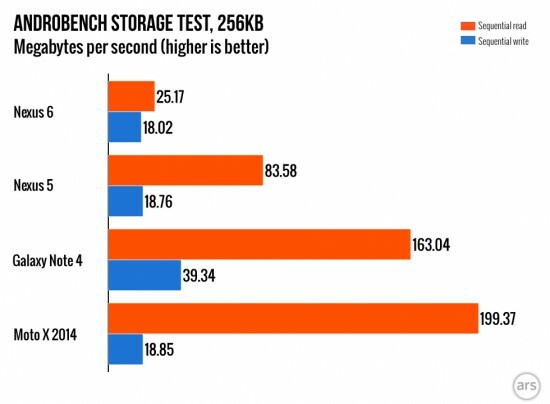 It’s still nothing to be proud of when comparing with 2013’s iPhone 5S who’s encryption does not appear to have any significant performance impact. This entry was posted on Monday, March 21st, 2016 at 4:08 pm	and is filed under General. You can follow any responses to this entry through the RSS 2.0 feed. Both comments and pings are currently closed. No doubt that rooted Android devices are the bed for viruses and malware. I also heard that the cracked keyboard apps act as keyloggers. Encryption of Android devices make much more sense to me now. Do we know what the situation is with the Snapdragon’s Cortex and Kyro based SoCs? Is Google still forcing v8 over Qualcomm’s hardware on the 820 and 821? I assume that the 808 and 810 are using v8. Also, I better add – This is a very good article. It was a really good read. Very good article, and its hard to believe google got this so wrong for so long. I’m an android user and currently “suffering” from what I believe to be horrible performance due to this issue on a Note 3. This is much more in line with results we had in our lab. Thanks for the response. What is weird is multiple people chimed in on that thread and said they had seen the same results. That isn’t exactly scientific but wondering why that would be. Different benchmark perhaps?